We commenced trading as Cartel Security Systems in 1989, experiencing continuous growth to current date, starting organically by the mid-nineties and embracing significant company acquisitions during the last decade. Due to the geographical spread of our branch network, mainland UK is now efficiently covered, allowing us to offer local effective service. 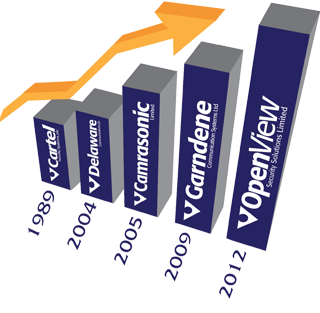 OpenView Security Systems Limited was formed by the merger of the OpenView Group of Companies in 2012. Under the new company structure, these former companies are now regional offices, creating a national network under one brand and business. We are now the nation’s largest privately owned security company – a larger single business with greater industry stature providing a consistent and focused approach as one business, with a turnover of £42M forecast for 2018+ with 330 employees.